This iPhone charger is so clever, MacGyver would be impressed! There is a world full of backup batteries and charging accessories for your smartphone, especially for iPhones. There are cases with built-in backup batteries – but they add a lot of bulk to the iPhone. There are backup batteries – but they are big, and you’ll need a cable, too. And if your backup battery of either type is dead, you’re out of luck. The Oivo – The Smallest Charger On-the-go for iPhone, an active Kickstarter project, is a tiny charger that fits on your keyring until you need it. Pull it apart, add four AA batteries, plug your iPhone onto Ovio’s Lightning connector, and you’re ready to charge your iPhone or to use the iPhone as it charges. The Oivo is said to recharge your phone as quickly as a 1A AC charger. Some batteries will only provide enough power for a partial charge; other batteries have more than enough power for a full recharge of the iPhone. (See the Oivo Kickstarter page for a list of commonly-available batteries and their charging capabilities.) When the backup batteries are drained, just replace them with four fresh AA batteries. The Oivo is so small, you could keep it on your keychain as a backup for your backup battery, because AA batteries are easy to find most places you find yourself. The Oivo is still seeking funding until Thursday, October 2, 2014 at 9:01 PM EDT . There are still a few early-bird pledges of $34 for one Oivo, but when they are claimed, the pledge will be $39. 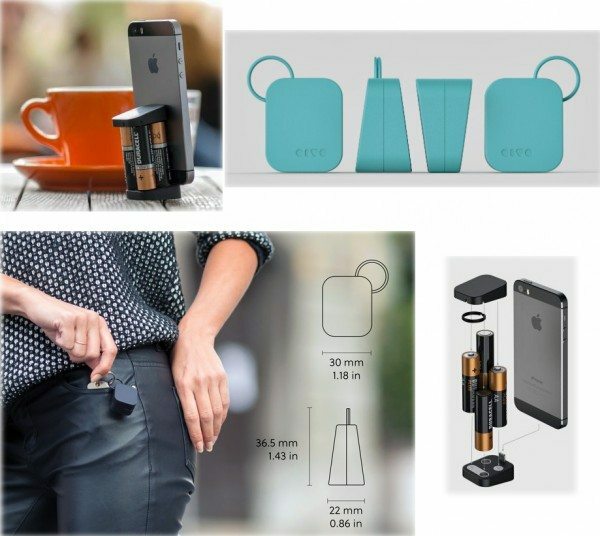 The designer says the plans for Oivo – The Smallest Charger On-the-go for iPhone are Apple-approved and says the Oivo will work for the iPhone 6. And by the way, if you’re interested in an Oivo with a microUSB connector for Android and Windows phones, you can pledge $2 to get yourself on a mailing list to be notified when it’s available. Can I use rechargeable batteries for this product? Patti, you’ll need to ask this question of the inventor at Kickstarter. Do you know I can reach him/her? It’s a cool device, but one would use a lot of batteries. Go to the Kickstarter page in the link above. There’s always a box with info about the developer; there’s a “contact me” button in the box. Oivo creator here. Yes, you can easily use rechargeable batteries and they charge even better then alkaline. Really great to hear that you like our product.